You can learn more about this exciting development in the article by Kevin Clark, "Church in Dramatic Revision of Nuclear Weapons Stance" in the Catholic magazine, America. Sojourner's blog spot also features a piece by Jim Rice, "Vatican on Nuclear Disarmament: Time for Abolition". 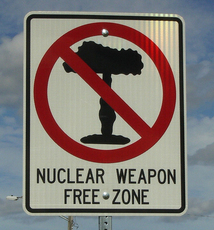 Thanks to the Nuclear Age Peace Foundation's wagingpeacetoday.blogspot.com for the image.